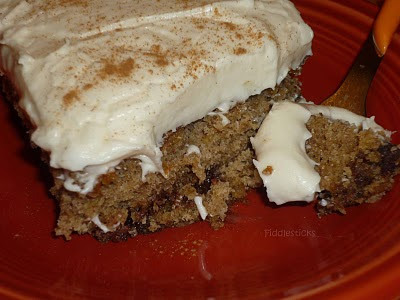 This was another one of those ..See it and have to try it right now recipes!! 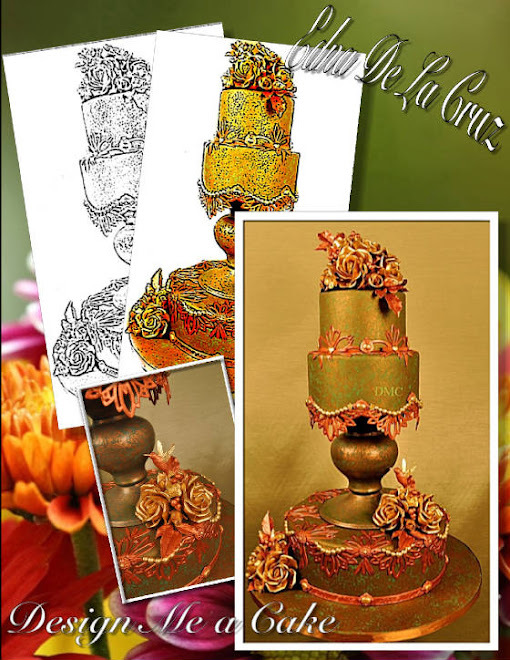 This gets added to the top of my list as one of my ( our) most favorite cakes ever! 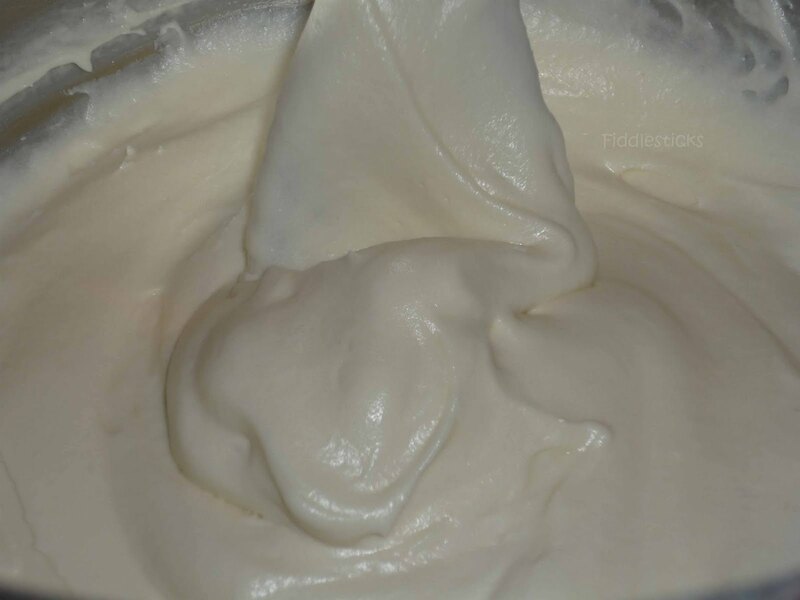 Delicious and easy and your house will smell wonderful ! I also want to add that if your NOT a frosting lover this cake would be Amazing Unfrosted and used like a snack cake.. It has the texture of a carrot cake and would be wonderful cut into Squares and served just that way on a platter! 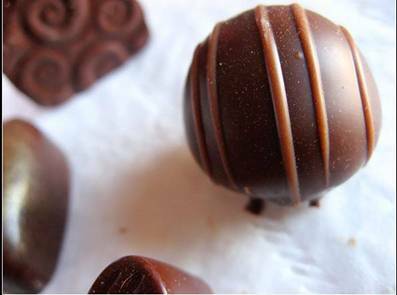 8 ounces chocolate chips ( I used a mix of milk and semisweet chips) 1/2 teaspoon liquor, such as bourbon or Scotch* (At the time of baking, my only liquor choices in my kitchen were Kahlua! Butter the sides and bottom of a 9″x13″ baking pan. Heat 1 & 1/4 cups water to boiling. Place the oats and butter in a large bowl. 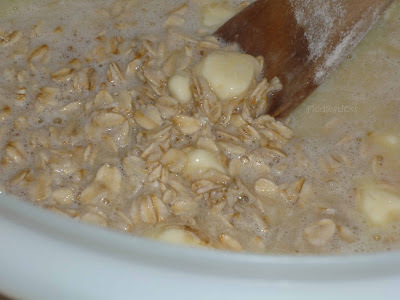 Pour boiling water over oat mixture. Wait 30 seconds, and then stir to moisten oats and melt the butter. Seat aside for 25-30 minutes. Whisk eggs, sugars, salt, baking soda, baking powder, and cinnamon. Fold in oatmeal, stirring until well combined. 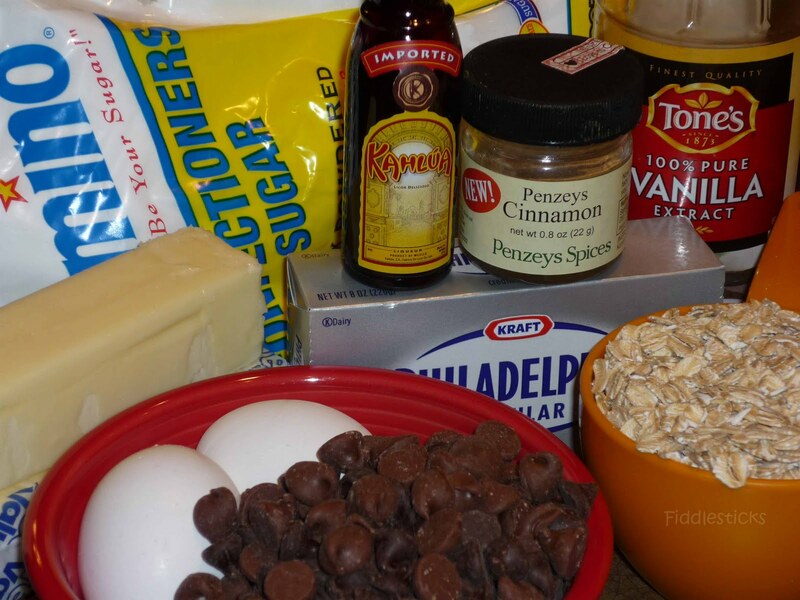 Fold in remaining flour, and then stir in chocolate chips. Pour batter into prepared pan. Bake 40-45 minutes until a toothpick inserted in the center of the cake comes out clean. Cool on wire rack for 30 minutes. I baked for around 35 minutes!!! Beat butter until smooth. Add cream cheese and beat until combined. Beat in confectioners’ sugar and vanilla extract until smooth (about 1 minute). 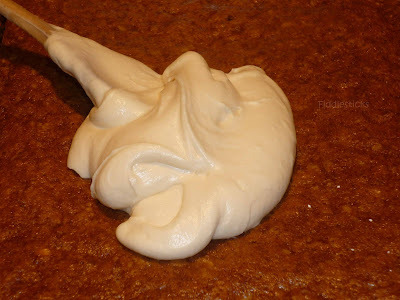 Spread a thin layer of frosting over cake. Chill for 15 minutes before serving. 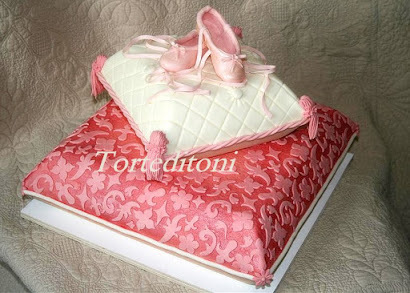 Store covered cake in refrigerator for up to 3 days. I used the different amounts for icing as I wanted a thicker layer of frosting! Oh and I also added a sprinkle of Cinnamon on top...Cocoa powder would also be wonderful! Photos may not be reproduced without permission from the author of this post. at an ICES Day of Sharing in Southeast Texas. 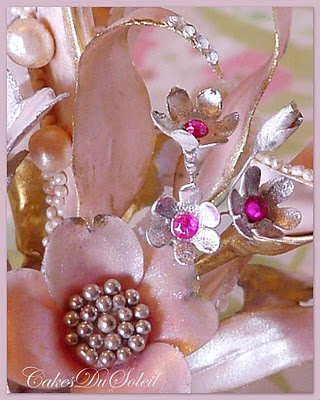 "What about a Jeweled Flower Topper?- You know, like Jeweled flowers on an antique brooch-- in the art nouveau style." I found that photos of floral brooches which most inspired me were called “pot metal” jewelry. 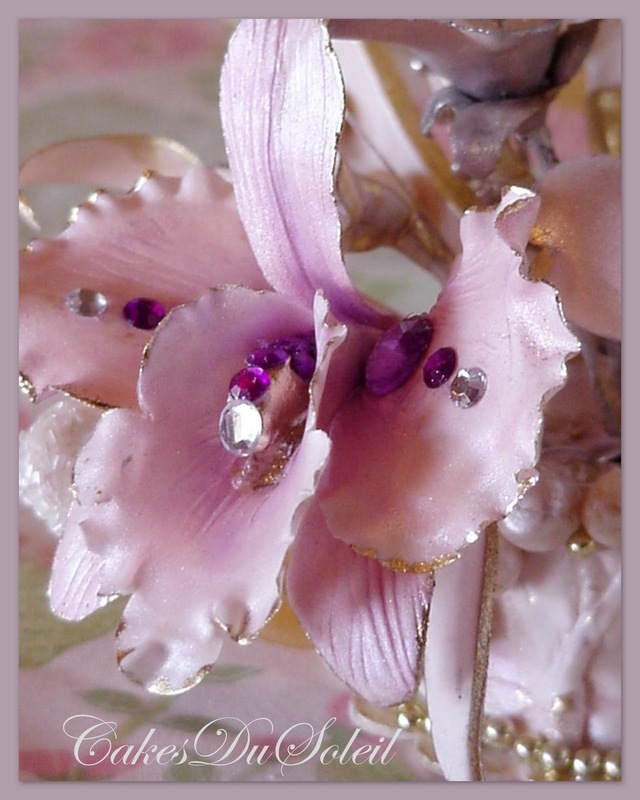 Jeweled Flowers, Architectural Interest, and a Base. 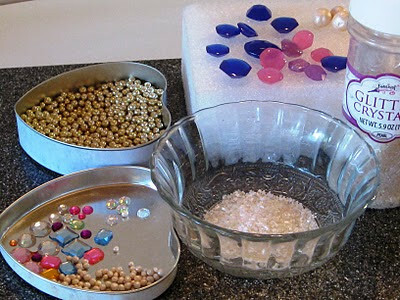 Have plenty of embellishments on hand. 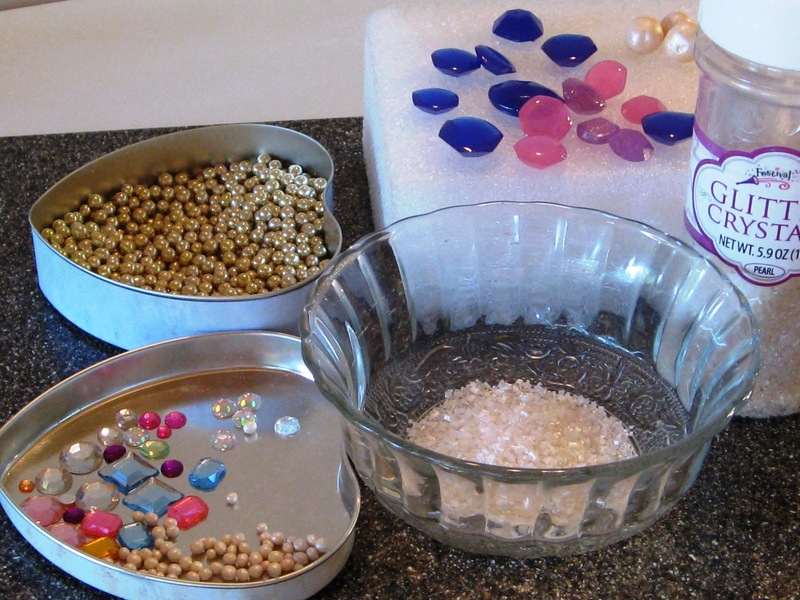 Dragees, seed pearls, non pareils, and gemstones. 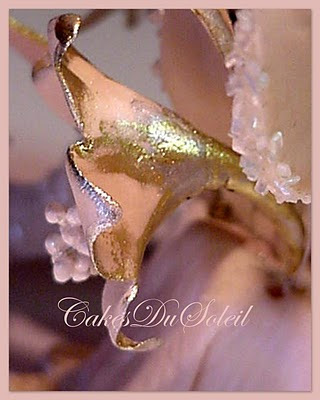 If you are a purist or making the centerpiece for a cake show, use only sugar gems. 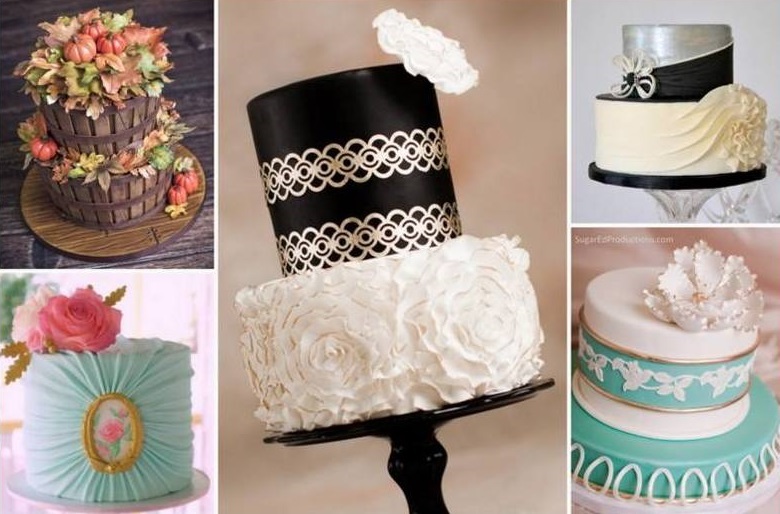 However, many brides opt to keep their topper as a memento and the sugar gems will slowly dull, so one may prefer to use a high quality crystal to withstand the test of time. Note- these florals are not intended to be botanically correct. Exaggerated features will enhance the overall jewelry effect. Start with the center of the flower. Use a #22 covered wire to support your flower adequately. 2. The petals can be cut using any available flower cutter. 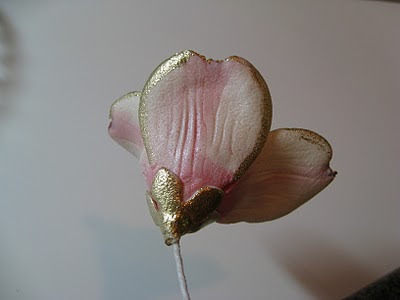 The gum paste for the petals should NOT be rolled paper thin as for a normal gum paste flower. 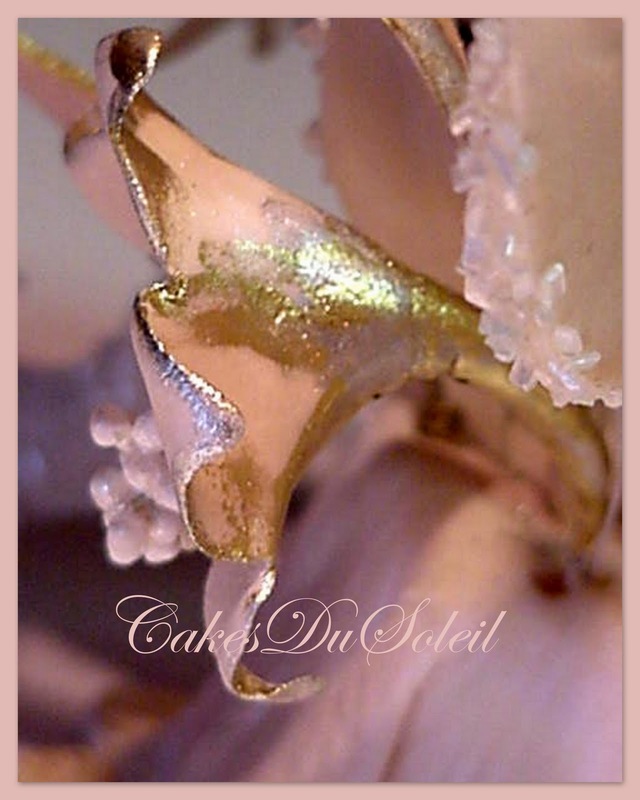 The thickness creates a nice edge to gild. 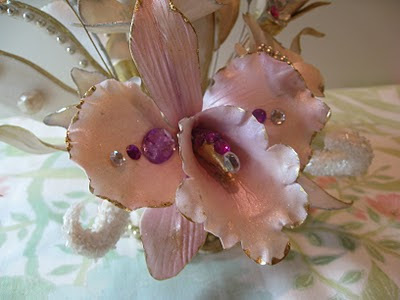 Pearlize your flower, then gild the edges using gold or silver luster dust. 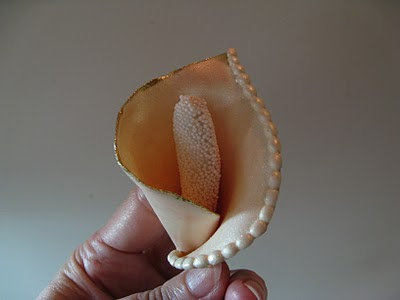 Pearls, dragees or sugar crystals can be used to edge one side of the flower. painted in a metallic luster dust. 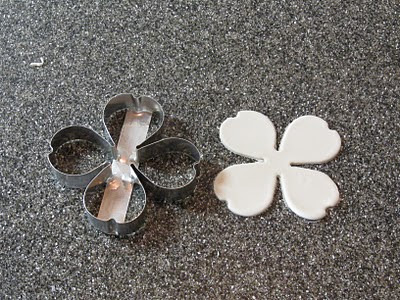 Using these three principals, you can use any cutters to create a beautiful floral arrangement. 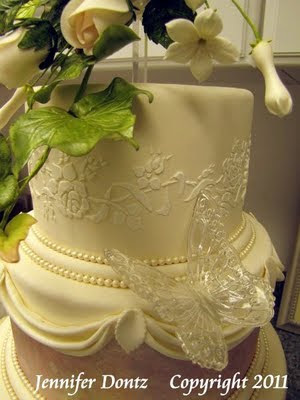 Incorporate several larger flowers along with medium sized and smaller filler flowers. 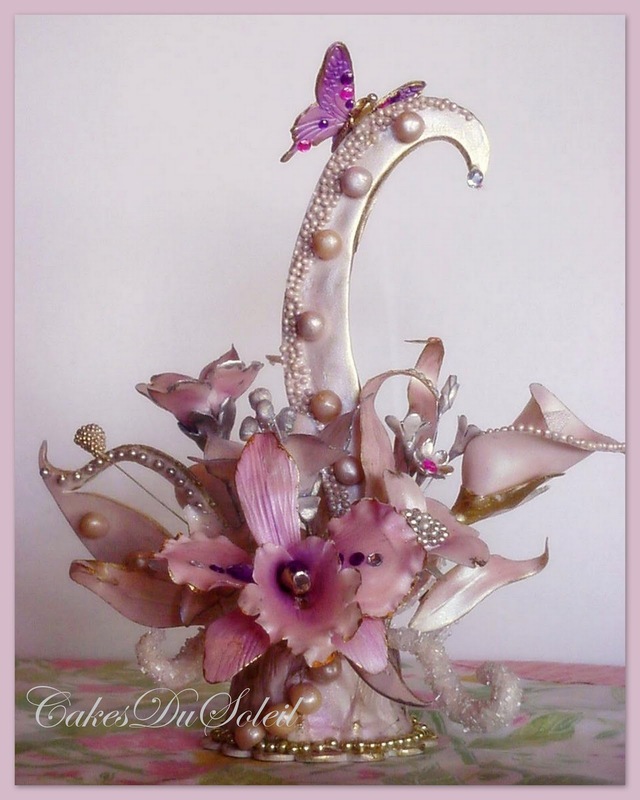 Orchids, lilies, dogwood, trumpet flowers and small blossoms combined can make a beautiful presentation. 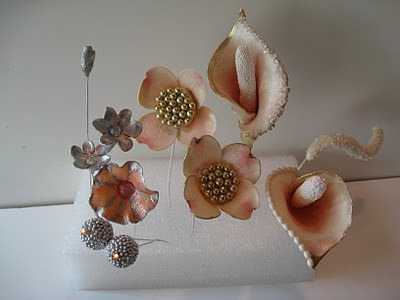 Leaves can also be wired then edged with gems. The same principals apply to making butterflies or dragonflies. 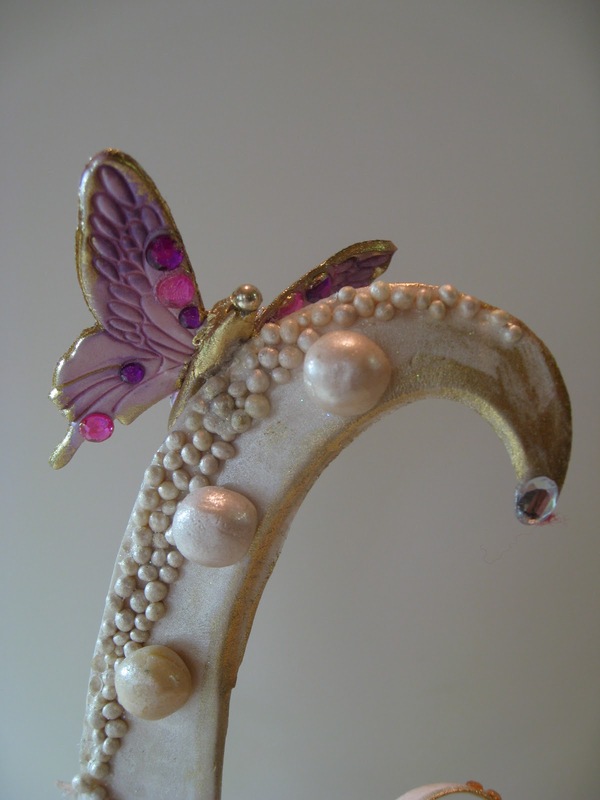 The center will be jeweled, the wings pearlized and the edges gilded. Gems are placed on the topside of the butterfly’s body. Small gems may be added to wings as well. Creating an architectural spray adds height and interest to the topper. 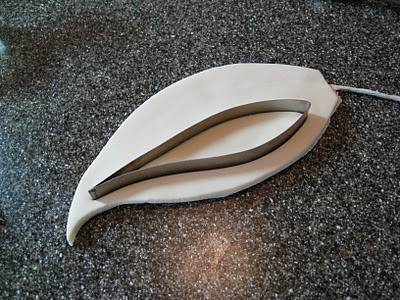 For an art nouveau style, use an art deco style cutter. 1. 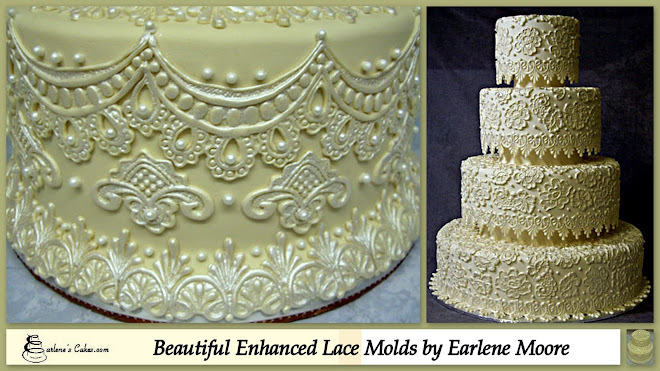 Start by covering #18 heavy wires with white floral tape. 2. Roll out two pieces of gum paste about 1/16” thickness. 3. 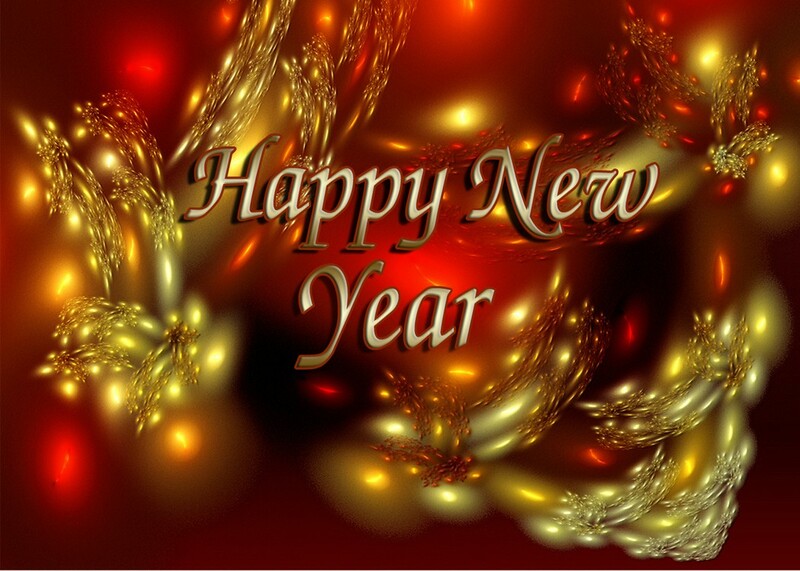 Make a slight indention on one using the largest cutter. 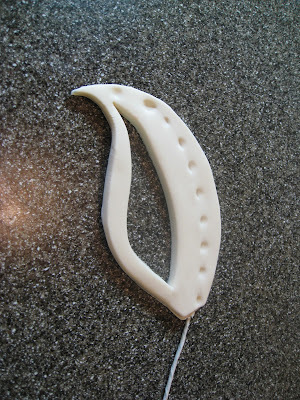 Moisten this side completely with gum glue. 4. Lay wire over the moistened gum paste, then the other piece over all, sandwiching the wire inside. 5. Using large cutter, press to cut. If desired, cut a design in the center using the smaller cutter. Be careful to avoid exposing wire. 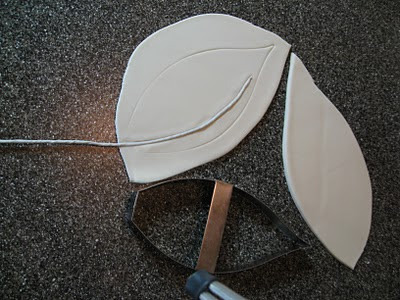 Use pattern (below) to make the tall arched element. 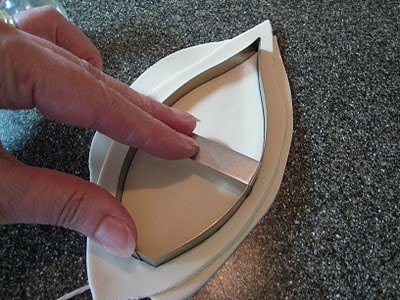 cut along the egde of pattern using a pizza wheel or PME wheel cutter. 7. Brush with pearl dust and paint edges with gold or sliver luster dust. 8. Embellish with sugar crystals, dragees, seed pearls or gems. 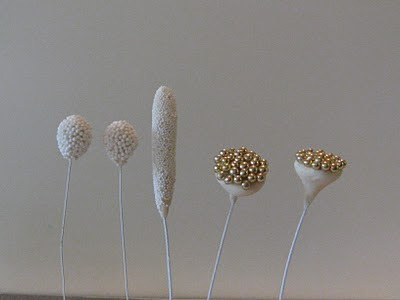 Other interesting ways to create sparkle for the arrangement is to add curved fronds encrusted with sugar crystals or pearls; or add a smallball of gum paste over hooked wire which has been moistened with gum glue. 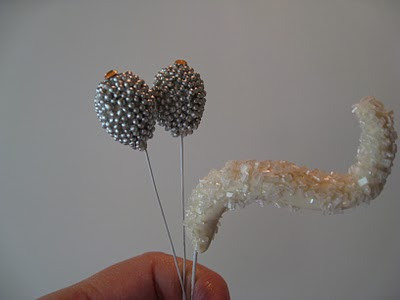 Cover with nonpareils, and then paint with silver or gold luster dust. 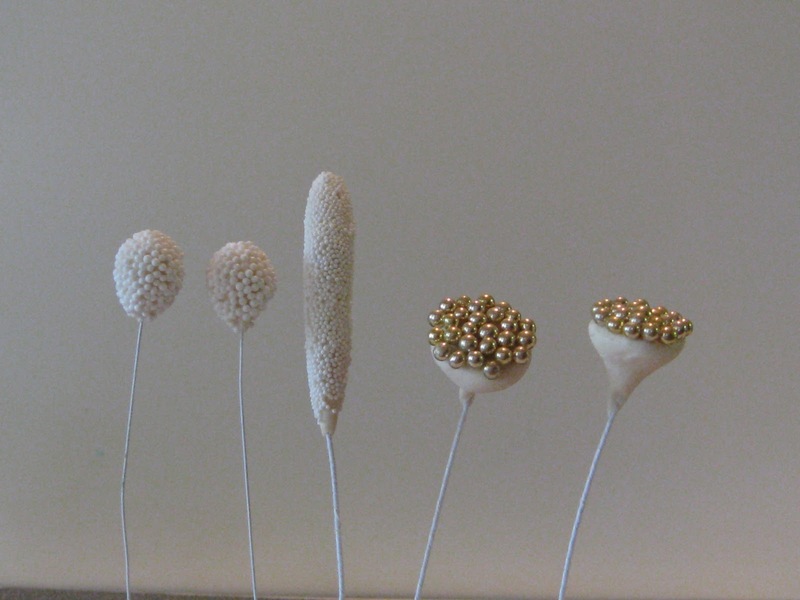 This will be the last step just before arranging flowers. It is important that the fondant on the base is soft so flowers will insert easily. 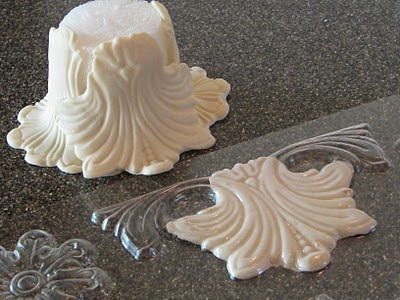 You will need a 2-3” base cut from the bottom of a Styrofoam cone, piping gel or gum glue, fondant, appropriate impression molds, gold or silver luster dust , and dragees. 1. Press gum paste into molds. Make two of each design. 2. 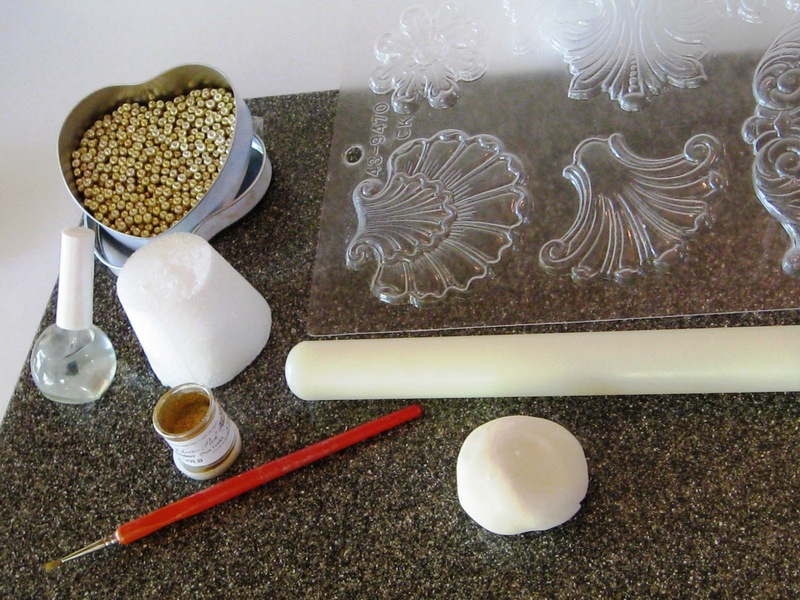 Moisten Styrofoam base with piping gel or gum glue. 3. 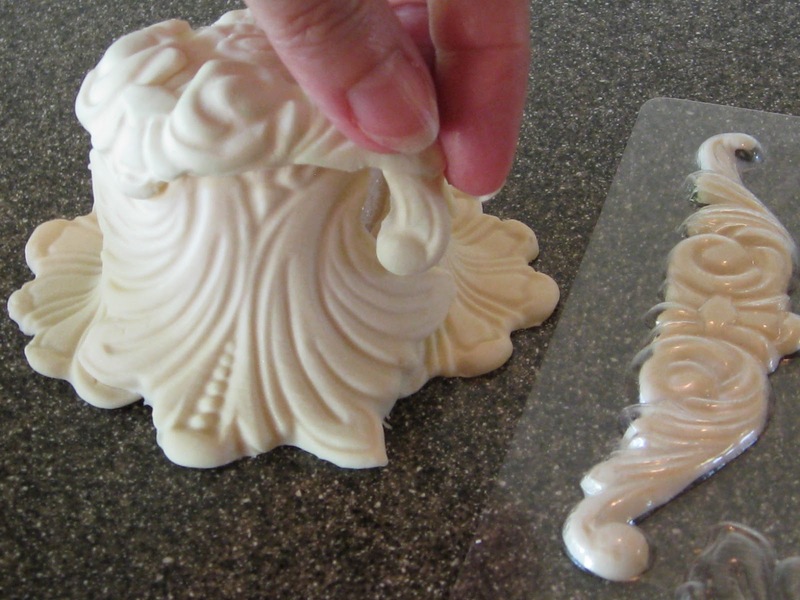 Overlay gum paste until base is entirely covered. 4. 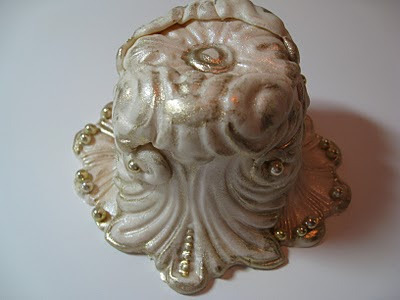 Pearlize entire piece, then gild edges with luster dust. 5. 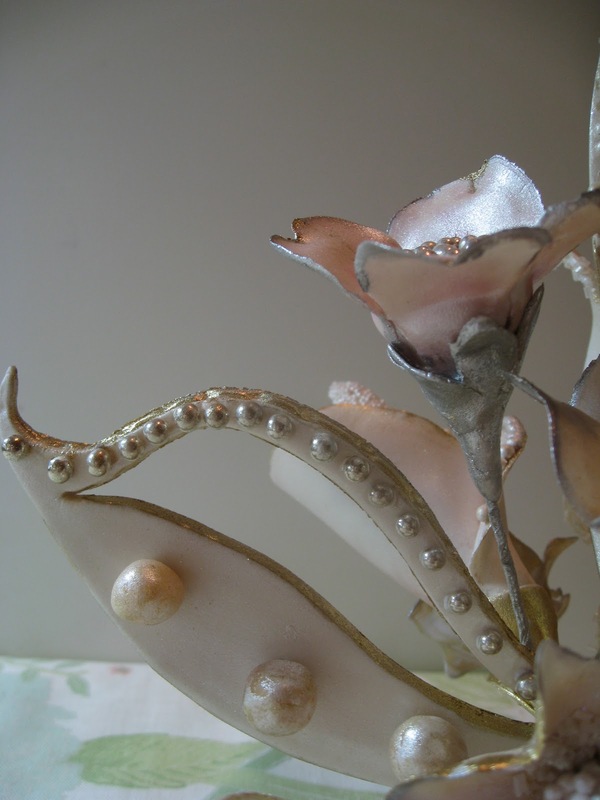 Add dragees and/or pearls in strategic spots for dramatic flair. This material may not be reproduced with permission from the author. Jacque and Rhonda would like to wish our followers a very Happy New Year along with a huge THANK YOU for being there for us along the way!! We have a lot of fun creating the tutorials for you. 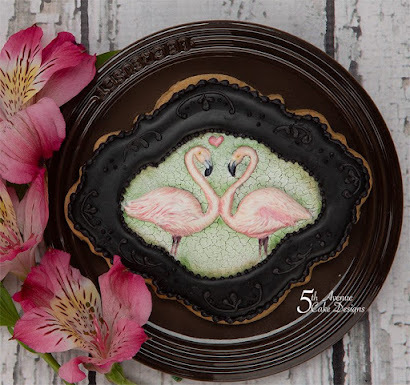 We are taking a break so that we may gather more ideas on tutorials for this blog. Any ideas are welcomed! Please add them to the comment section of this particular blog. In the meantime...you may want to check out the individual contributors pages to see their wonderful work. 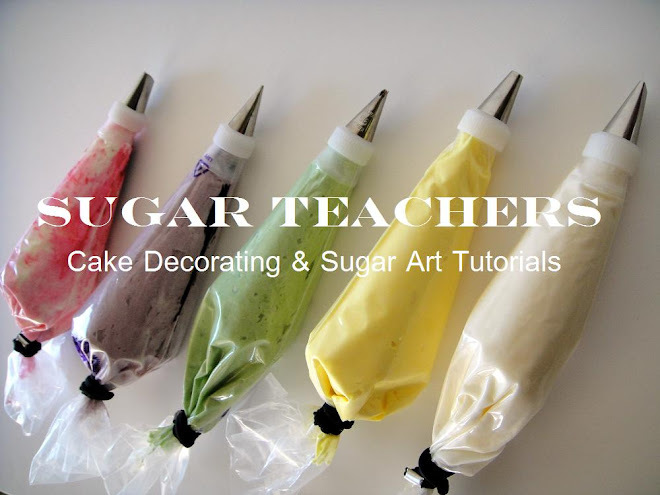 You can also go to YouTube and type in "cake decorators" to see tons of fun videos on cake decorating how-to's. OH! Let us know what new cake toys you may have received at Christmas!